The key to these is a marker for the "front" of the cupcake. If you look closely it looks like the flowers are not in a pattern but where you see one pink flower, that is the "front" of the cupcake. It is ideal for the first bite to be on that side to see the full carrot in the middle. But to be honest if you eat it from any direction (as I tried with a few :) ) you will see the orange carrot, if just won't be the full width view necessarily, just a thin carrot. There's not really a recipe because of the box mix but I will tell you about the method involved. Preheat the oven to 350F. Line a pan about 7" x 9" with non-stick foil (you can spray the pan if you want to but I think the foil is easier). Place cupcake liners in a cupcake pan. First, you want to prepare the box mix as directed, then put about 1 cup of batter into a small bowl and set aside the remaining batter. With the 1 cup of batter, stir in orange food coloring until it reaches the desired color. Pour the 1 cup of orange batter into the 7" x 9" lined pan. Bake for about 11-12 minutes or until just set but not 100% baked. 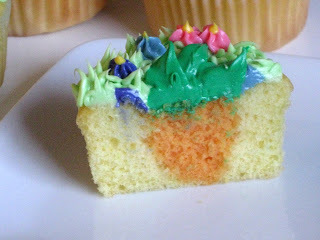 You want to be able to work with the cake even though it's not completely baked. Remove from oven, cool slightly. 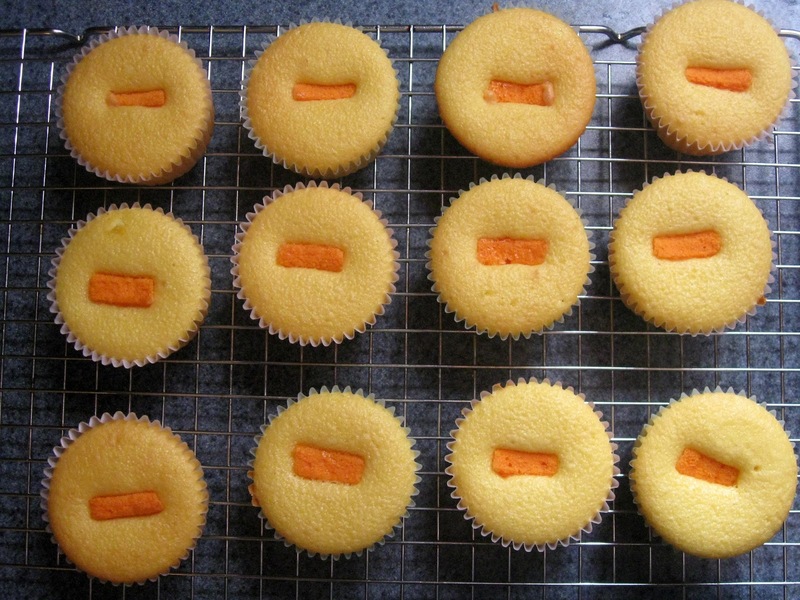 With a knife or the bottom of a carrot shaped cookie cutter cut out carrots from the orange cake. 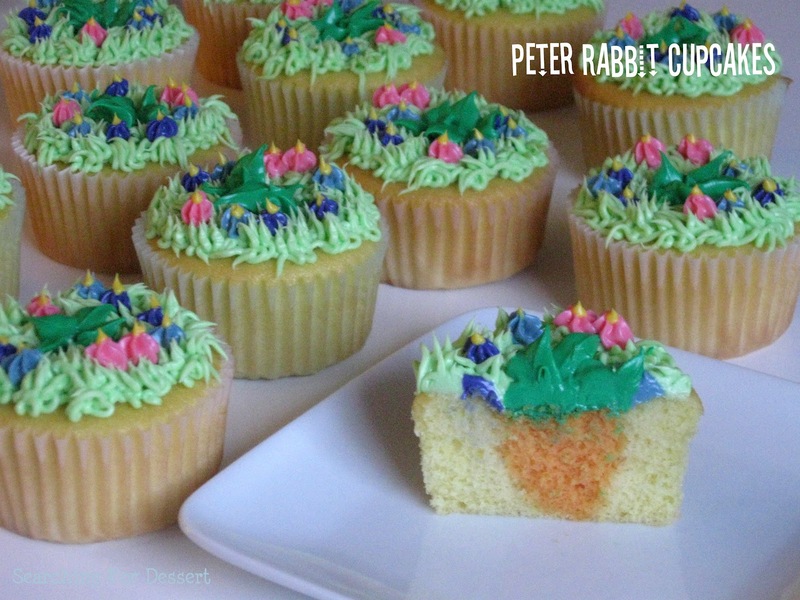 Make sure not to cut the carrots taller than your cupcake liners or they will stick out the top of the cupcake. 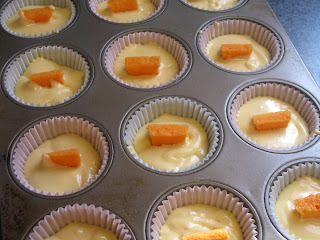 Once you have the carrots cut then spoon about 1 tablespoon of plain batter into the bottom of each cup (or portion as you go if you want too). 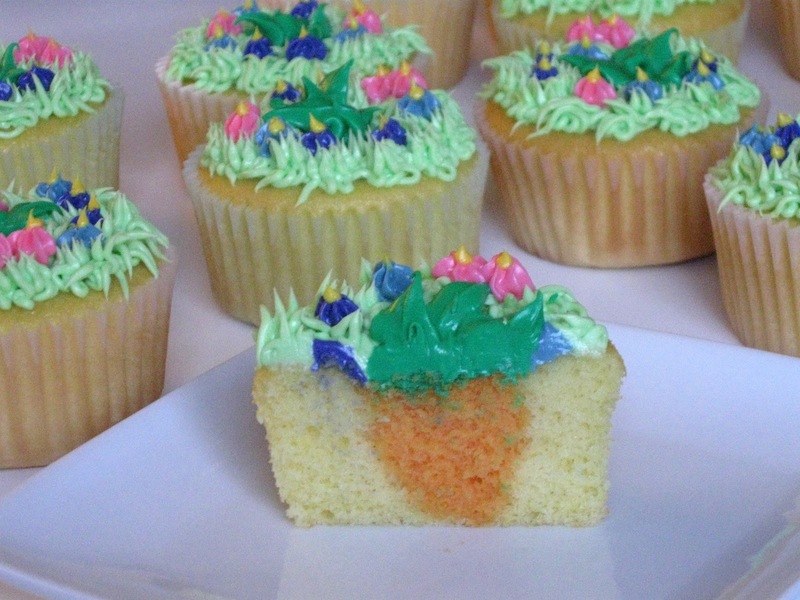 Carefully place the point of a carrot into the batter on the bottom of a cupcake liner. While holding the carrot (so it doesn't fall over) spoon or scoop in enough batter to fill up about 2/3 of the liner. You want some of the carrot above the batter so that the batter will bake up around the carrot. Repeat with the rest of the cupcakes. Bake about 18-20 minutes or until a toothpick inserted in the center comes out clean. Cool completely. Frost as desired. I thought it looked cute with the "top" of the carrot sticking out of the "garden". If I could change something I would have made the carrot stick out a little taller over the garden. Maybe a fun idea would be if you can find some green fruit roll-ups (or something similar) to cut out the shape for the stem and roll it to a round shape then place it in the middle of the garden. Please feel free to ask any questions and happy baking! This is such an awesome idea! Love it. Pinning! I am always impressed with cakes that have another cake baked into them!! Love love love the carrot in the center of your cute cupcakes!!!! 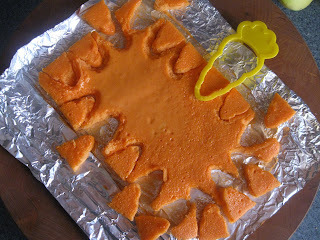 Awesome idea -- and an unexpected way to create the carrot! I would love it if you would consider linking to Busy Monday at A Pinch of Joy, a Sunday through Thursday link party for ideas that make life easier, better and more fun! Thanks for stopping by Justine :) I've been to your site before and it's really great! i'm not even a kid and these things are magical! What a great idea! 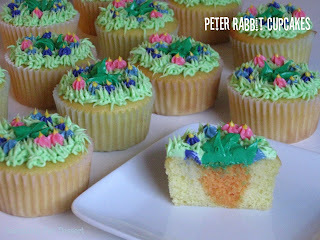 These cupcakes are adorable and so perfect for Easter! !